It's no secret that Wisconsin produces a lot of beer, and Wisconsinites in turn consume a lot of beer. According to the Beer Institute Wisconsinites actually do not consume the most beer per person, per year. So the question is: Where is all of the excellent craft beer of Wisconsin being sold and enjoyed? The following visuals should explain the regional economies of Wisconsins breweries, and also provide some insight into who really is enjoying all the Wisconsin suds. 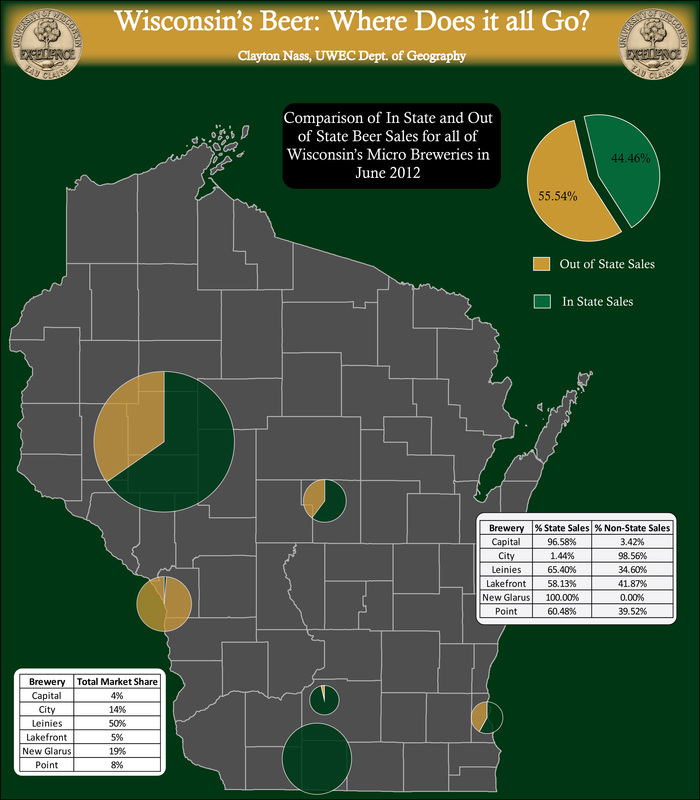 Figure 4 displays the production and sales from the "medium-sized" Breweries that call Wisconsin home. These were defined as breweries that produced on average between 20 and 60 thousand barrels of beer per year. *Note that Leinenkugels Brewery was bought out by MillerCoors Inc., and is now producing well over the 60 thousand beer threshold to be defined as a "medium-sized" brewery. However, we chose to include it in the study because of its regional proximity to the University. Figure 4. 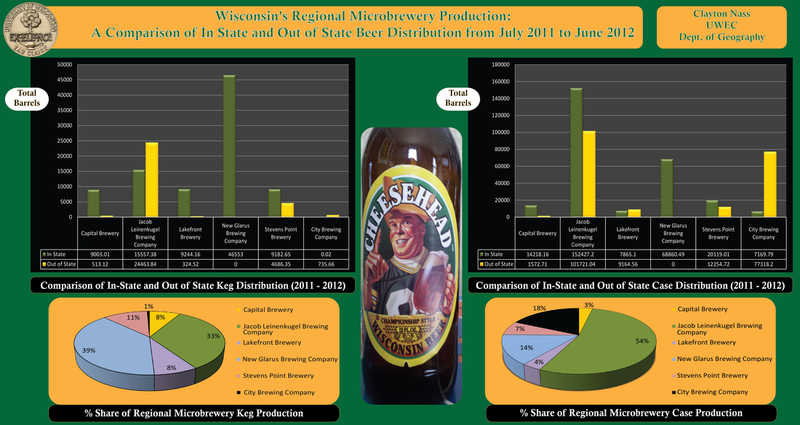 Regional Microbrewery Production in Wisconsin July 2011 - July 2012. 1. Despite being bought out by the second largest brewing corporation in America (MillerCoors), Leinenkugels still sells the majority of its beer (65.4%) in-state. 2. New Glarus Brewing Company sells 100% of its products in the state of Wisconsin. 3. Despite having the 3rd largest share of Medium Sized Microbrewery Production in Wisconsin (14%), City Brewing Company sells almost all of its products out of state. Figure 5. Where Does the Beer Go?